"We'll put your repair on the fast track!" Hours: M-F 8 am - 4:30 pm, and Sat. 8 am - noon. Check back later for greater details on the many advantages to having your automotive body repairs done at Schurman's in Petersburg, IL. Also, let Steve Schurman know what additional information you would find useful on this web site! 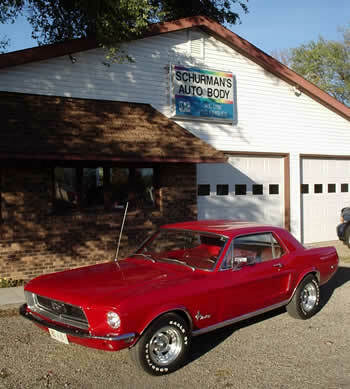 Founded in 1968, Schurman's Auto Body is the oldest Auto Body Shop in Menard County, Illinois. Steve Schurman operates with the same philosophy of quality repairs and superior customer service that has kept the shop in business for over 37 years! We have a great deal of experience working with the full range of automotive insurance companies. Our shop can repair body and paint damage on just about any car, truck, or SUV (Sport Utility Vehicle) make and model. (Both foreign and domestic!) Come in and see Steve Schurman for an estimate, or just stop in to discuss how Schurman's Auto Body Shop can meet your auto body repair needs.